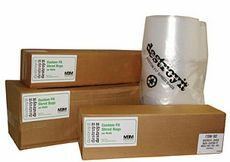 Destroyit Ideal-MBM Paper Shredder Bags are specifically sized for your shredder model. Use Destroyit Paper Shredder Bags to collect your shredder waste in an efficient manner - allows for easy clean-up and removal from your shredder recovery bin. For quick removal of your shredder waste collection bin.